It seems crazy to think about anything else when mysterious bombers are blowing up your hometown, but I learned over long years living in Bangkok to just do what you "normally" do. The times may not be normal, but you can be. 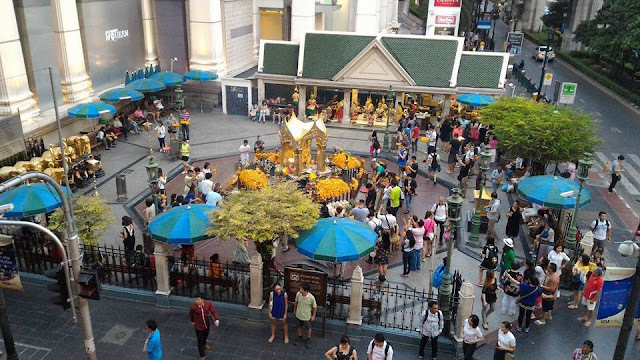 This photograph portrays the Erawan shrine adjacent to the Grand Hyatt Erawan hotel on Ploenchit (Sukhumvit) Road on a normal day. The hotel and the shrine are at the Ratchaprasong junction of Rajadamri Road on the right side of the photo and Ploenchit / Sukhumvit Road at the bottom: the arterial heart of Bangkok. The real estate in this part of the metropolis is the crown jewel of the Crown Property Bureau, which is why it was overrun by Red Shirt mobs during the 2010 protests. The Erawan Shrine as viewed from the elevated walkway near Chidlom station. The Erawan shrine is generally thronged by people who pray there for good fortune and protection. "Erawan" refers to the three-headed elephant Airavata from Hindu legend. 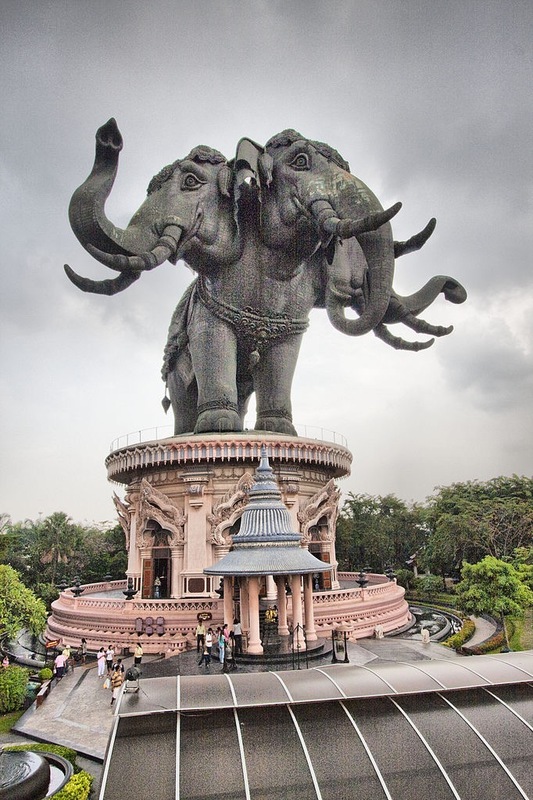 The Thai knew the name of Airavata from the Ramayana, but they mangled the pronunciation of his name. The actual name of the shrine in Thai is Thao Maha Phrom. Despite the English place name, Erawan is not the focus of this shrine, which was named after the hotel, not after the gold Brahma idol at its heart. I am not a Hindu specialist, and despite living for the past decade in the Kingdom, I am too wise to consider myself an expert on Thai Buddhism, so I will leave it at this: Thai people direct their prayers at this shrine to the Hindu god Brahma, whose four faces represent differing aspects of the god. The Thai call this exemplar of Brahma "Phra Phrom." 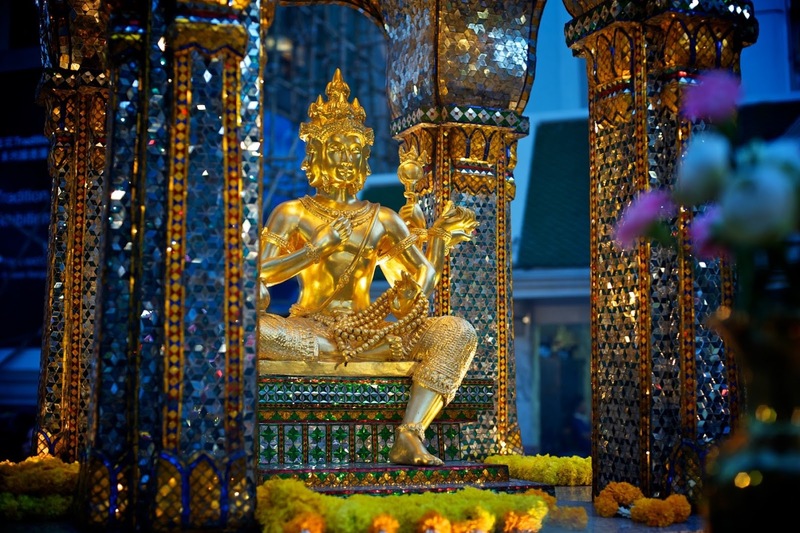 Thai Buddhism is considered Theravada, with a syncretic Hindu layer atop ancient animism. This shrine is popular among Thai women, who wai and pray for a reversal of misfortune from the elevated walkway looking down on the site. As you walk from the Ploenchit station on the SkyTrain line West towards Chidlom station, you see women pausing and praying on the left side of the skywalk. It is common to see them wai'ing to the idol as they pass by. There are always people praying at the shrine, leaving offerings before each face of Phra Phrom, whose four faces must be individually propitiated. The benches along the fence can be seen at the bottom of the photo, and CCTV recordings confirm that the bomb was left by an individual now called Yellow Shirt Man in a backpack on the middle bench. The device size was said to be 3kg, allegedly comprised of TNT, though some media report that the device was a pipe bomb filled with gunpowder. Other open sources report that the device included steel pellet shrapnel. Yellow Shirt Man, with his backpack containing the device. Note the bandages on his arms, probably concealing tattoos. For those confused about street names, the street in front of the shrine is Ploenchit Road. As you follow Ploenchit Road to the East, it renames itself Sukhumvit Road. It is the same road. The name just changes. Most locals give up and call this road Sukhumvit. The intersecting road is Rajadamri. The junction is called Ratchaprasong. The SkyTrain elevated walkway, or skywalk, is at upper left. This view is straight down Ploenchit Road in the direction of Sukhumvit Road. The top of the shrine can be glimpsed just beyond the blue umbrellas on the right. During any period of unrest, all facts should be considered labile. 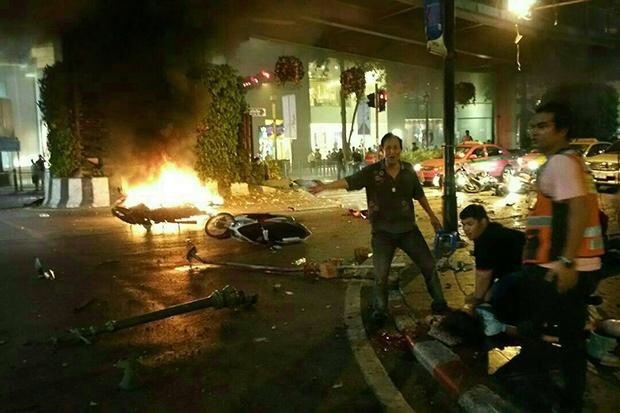 In the early hours after the blast, for example, Thai media were reporting that two additional devices had been located and defused from the front of Gaysorn Plaza, a shopping center on the opposite side of Ploenchit / Sukhumvit. This is how the shrine appears at busy times, surrounded by worshippers. The shrine is popular among Hong Kong, Taiwan and mainland Chinese, and Thai people. It now appears that these devices were no more than suspicious packages, and the media no longer mention them. Without undetonated devices to examine for forensic purposes, the Thai authorities now have no option but to unravel the mystery of this bombing the old fashioned way, by combing the crime scene to recover bomb components, so it can be reconstructed. A second bomb attack was perpetrated at the Saphan Taksin boat dock the next day, but the bomber missed his aim and the device exploded harmlessly in the water. While recovering bomb fragments from the river will be difficult, it should be possible to reconstruct the original device. This photo was taken moments after the explosion. The cameraman is standing at the corner of Rajadamri. Gaysorn Plaza is in the background. The motorcycle burns on Ploenchit / Sukhumvit Road. The sidewalk paralleling Ploenchit / Sukhumvit Road is depicted on the right side of the photo above. During rush hour, which is when this device was detonated, this main artery at the heart of the city is gridlocked. My conservative guess is that the Erawan shrine was surrounded by hundreds of passersby and worshippers. The bomb wreaked havoc among the motorcycle drivers who winnowed their way to the front of traffic waiting for the light to change. Their demolished motorcycles in the photo above are mute testimony to the yield of this explosive device. The bomber removes his backpack (at 9 o'clock), behind a screen formed by Red Shirt Man, White Shirt Man, and Black Shirt Lady. 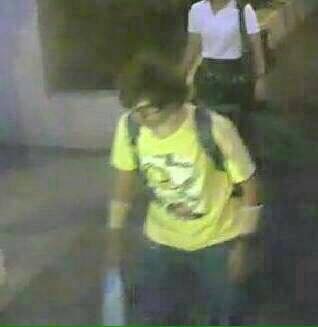 All except Black Shirt Lady have been interviewed by Thai authorities and dismissed as innocent. The bomber knew. While we denizens of Bangkok strive for normality under abnormal conditions yet again, we contemplate the sociopathology required to commit such an act of mass murder: 20 dead. 125 injured. There is nothing normal about it. You have to be supremely irresponsible or a special sort of evil to place a bomb in a place like this, at a time like that. 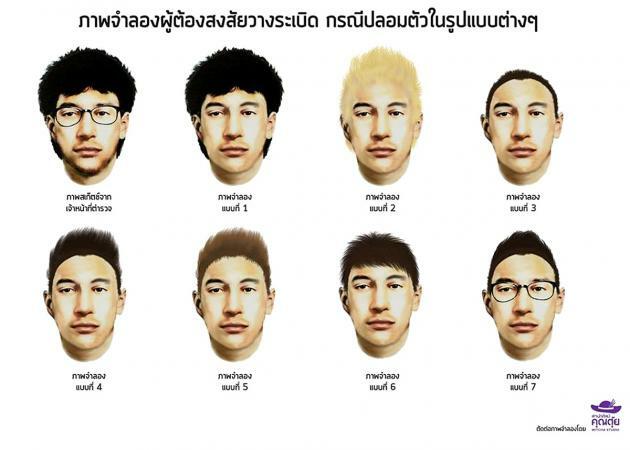 Richard Loyd Parry, Asia Editor at The Times newspaper, reports that Thai authorities are canvassing for him using a passport photo in the name "Mohamad Museyin." Nationality is not yet reported. Photographs credit: Wikipedia and the Phra Phrom Center. Other photos from open source news media and social media. Special thanks to Major Mark Smith, US Army-retired. Updated August 27, 04:12 hrs.